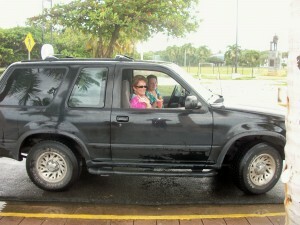 So many more posts for my blog could have come out from last week-end’s trip to Puerto Rico. It is so funny because my friends, here in Rehoboth, are used to me not letting them touch their food at a restaurant until I have taken pictures. I had to work a little harder in the Island of Enchantment since they were not used to it. Slowly they got the hang of it. Some of the pictures were taken so fast that I am not really going to publish them. You are probably saying “thanks”. Enough is enough, right? Oh, well. 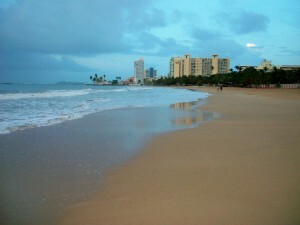 I stayed in Isla Verde, which is a district of Carolina, bordered to the north by the Atlantic Ocean and to the West by the San Juan area of Condado. 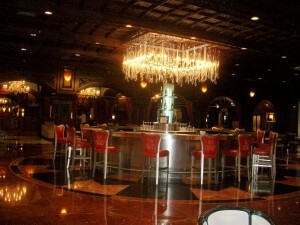 It is a tourist area of Puerto Rico, where restaurants, bars, and casinos are found. 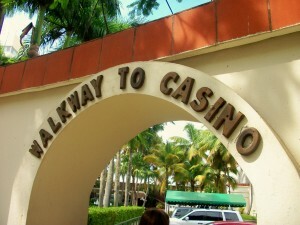 Some of the hotels found are The Ritz Carlton, El San Juan Hotel, and The Intercontinental, among others. The beach is a beautiful cove. Walkers, joggers and sunbathers are all over the place. 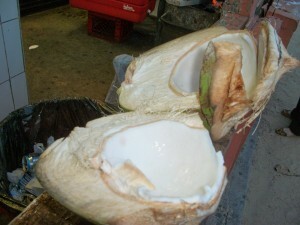 Also, you will find the man selling fresh coconut ice cream. I did not have any, which is probably good since now I am paying for my indulgences. I walked the beach in the early evening and also sat down to join all the beachgoers on Saturday for a little bit of sunbathing. The water was so warm; but cold to some of the natives. I reminded myself how relaxing this visit was. But, all good things come to an end and so was my trip. 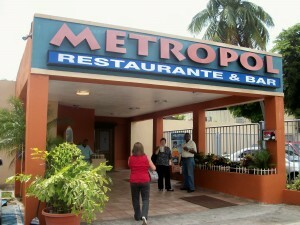 On Tuesday, the “primas”, or cousins got together for lunch at the Metropol Restaurant. 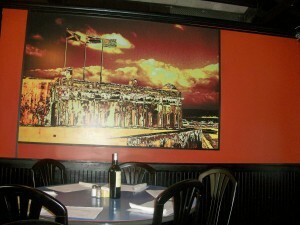 It is a Cuban and Puertorican restaurant, located at Avenida Isla Verde, tel. 787-791-5585. It is right next to the Club Gallistico of Puerto Rico. 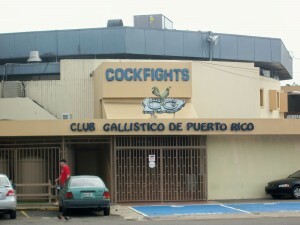 This is the club where cockfights take place. Cockfighting in Puerto Rico is recognized as a cultural right of Puertoricans and I am leaving it at that. The Metropol serves latin food and I wanted something typical since I was taking a plane that evening. We had croquettes, turnovers, corn sticks, alcapurrias, which are plantain fritters, accompanied with a red sangria. 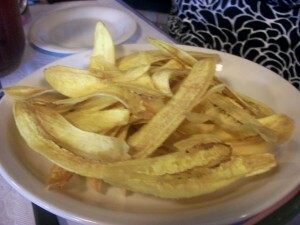 One appetizer that brought memories was the fried plantain chips. These were long, just like my grandmother used to make them. The service was good and the restaurant was comfortably crowded. The decoration was definitely Spanish. I had been on a chicharrones de pollo kick. These are pieces of chicken, fried; but not just like any old fried chicken. I can’t explain it but they are delicious; crispy and so well seasoned. Puertorican rice and beans were a must, of course. Our waiter told us they were the best. My lunch also included fried ripe plantains. 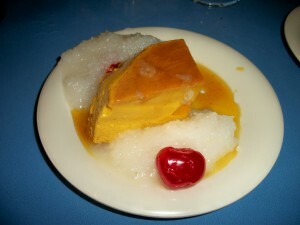 For dessert we had the diplomatic pudding that was like a flan, but a thicker consistency and included coconut. To tell you the truth it was o.k. but not that great. 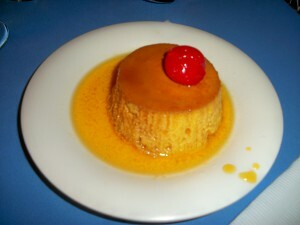 The vanilla flan also was good but I have had better, including my own. Oh my gosh, we were so full. How can anyone eat this way at lunch? Do they still have siestas in Borinquen? 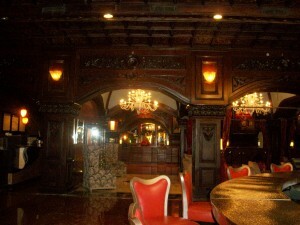 We decided to visit the El San Juan Hotel, which was down the street. Walking was going to be the way we were going to get there. A little exercise, por favor. 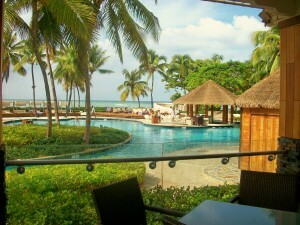 There are 2 hotels that I truly love in Puerto Rico. One in Old San Juan, El Convento, and this one, the El San Juan Hotel. I was longing to see if it had stayed the same. 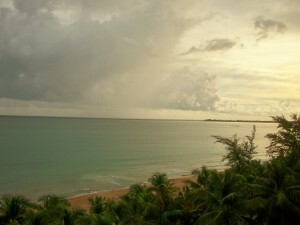 The El San Juan Hotel is located at 6063 Isla Verde Ave., Carolina, P.R. 00979. 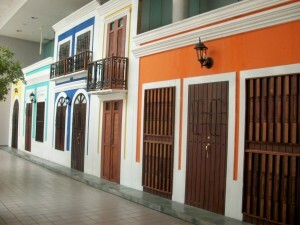 Website is www.elsanjuanhotel.com. 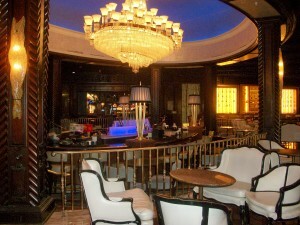 It is part of the Waldorf Astoria Collection. There are only 24 hotels under this designation and 2 of them are in Puerto Rico. The Conquistador in Fajardo, on the eastern side of the island is also one of them. I cannot say enough about this hotel. It should be the pride of San Juan. 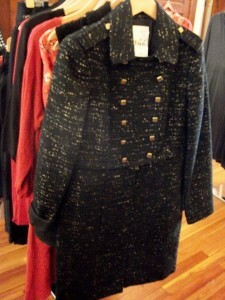 It will take you back to a time of craftmanship, a time of ease and elegance; a time of sophistication and style. I was mesmerized with the woods and floors used throughout, the shops, the restaurants and how the hotel still can be a tropical paradise exuding old-world classic elegance at the same time. And yes, we went to the Casino and deposited $20 in no time. This hotel is priceless; still one of my favorite hotels just like the one in Wilmington, Delaware, The Hotel DuPont, and The Jefferson Hotel in Richmond, Virginia. Guess what? 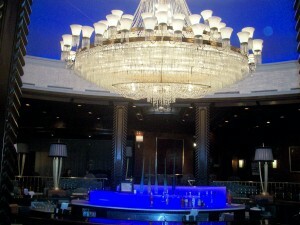 The moment I laid my eyes on that beautiful chandelier, I knew it had not changed. Of course I have tons of pictures; my computer is saturated with them. She is running a bit slow; must be overloaded. 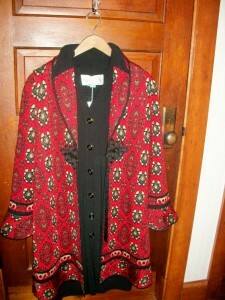 But, I do have a few posts from my recent trip to the Island of Enchantment. I had not flown on American Airlines in some time and I have to tell you how surprised I was to hear that there will be a lot of flights cancelled in the next months. This particular plane left from Baltimore, Maryland and it was crowded. The service was excellent and cordial. The moment I saw the Island I was full of expectations. Lots of things to accomplish in a few days; mostly getting together with family and friends. The island did look pretty from the airplane and the first thing I saw at the airport was a replica of a street in Old San Juan. It look beautiful; always those colors say you are definitely on the island. I found my Piraguero in Ocean Park. 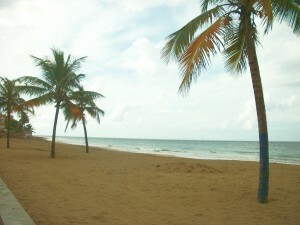 Ocean Park is between Isla Verde and Condado, both areas popular with tourists. 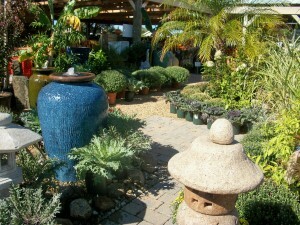 It is a tranquil, tree lined neighborhood with lots of Bed and Breakfast Inns. 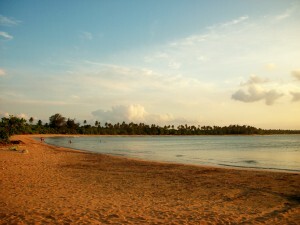 The beach in this area is ideal for swimming because of the wide ocean front and offshore reefs. What I did not know was that just as I was a frustrated “piraguera”, he was a frustrated photographer. There was his cart and the block of ice and bla bla bla I went; how I loved the piraguas and how I gave the Puertorican ones the highest rating. 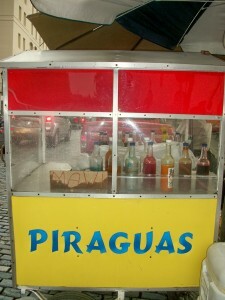 You have to remember that just the sight of a “piragua” cart makes me smile. The piraguas used to be served on a paper cone. Times have changed and they are now served on a plastic cup. The “piraguero” was very liberal with the pouring of the syrups. A dribble here or there on your fingers evoked memories and were a childhood rite of passage. Sticky fingers is what I got. The dilema was that I could only have one but I love 3 flavors. 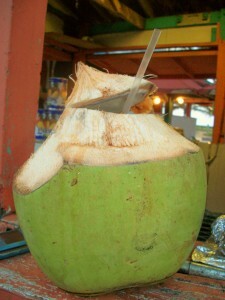 The tropical flavors were tamarind, coconut, pineapple, guanabana and melao. My combination was going to be cream, tamarind and frambuesa. Suddenly, he is going to take my picture. Yikes!! In front of the cart, holding my hand guiding me to the perfect spot; even taking the one in the car as Margie and I were getting ready to go. 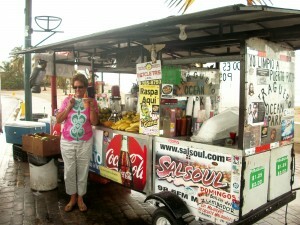 Well, by the time I got to eat my “piragua” the flavors were completely blended. Hot it was and therefore it was melting quickly. More than sticky fingers is what I definitely had. What a mess!! But, I loved every minute of it. Once again I found myself traveling to the island of Puerto Rico. I have told you that I grew up here and coming back stirs all kinds of emotions. This time I flew from Baltimore, Maryland, and the flight was quiet; that was strange because loud is more like it should have been. The airport in San Juan was quiet, as well, and the luggage was on time. What was going on? I hope this Island of Enchantment was not changing. That was just a little teaser, soon enough there were the traffic jams, the loudspeakers on top of cars; I don’t know what they were announcing since elections are not at this time. Potholes, many, as well as crowded streets. 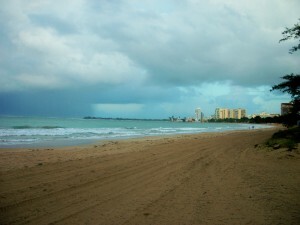 But then, as I unpacked and went on a walk with Margie on the beach in Isla Verde, I smelled it again. It was that smell; only indigenous to this Caribbean Island; salitre. It is that salt mixed with seaweed and I don’t know what else but brings so many good memories of growing up in Puerto Rico. 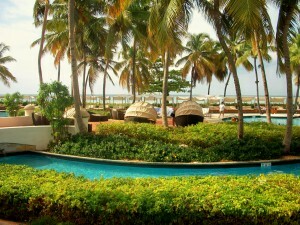 The palm trees and the coconuts on this stretch of beach are particularly beautiful. I think it is funny that if you live here you do not notice the scenery, but it is only when you are away that you learn to appreciate it. I am the best public relations spokesperson for the Puertorican Piraguas. They are the best, truly delicious. 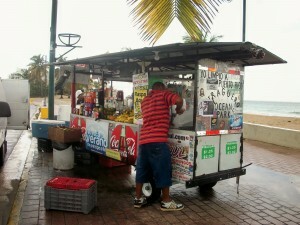 The moment I saw the cart in Ocean Park I stopped and I had one with cream, tamarind and frambuesa. 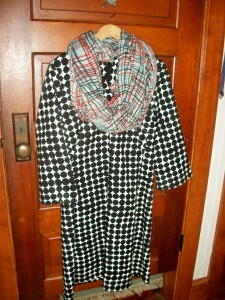 I have a picture but it will come in the next post. I am traveling today. 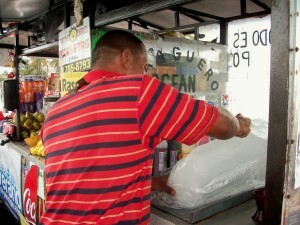 Just watching the “piraguero” do his thing; shaving the ice and pouring the syrups was priceless, to me. A surprise birhtday party, a family reunion, seeing old friends again, eating chicharrones de pollo, walking on Ashford Ave., yes, it has been a nice week-end. I am thinking that there are a lot of things that need to improve in this island. The economy for once and with that improving, maybe the crime situation can be improved as well. But, no, I don’t want anything else to change including the traffic jams, potholes, and the crowded streets. 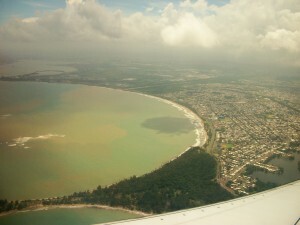 Afterall, it is what makes the island; it would not be Puerto Rico without all these imperfections. I will talk to you later….hasta luego…nos vemos…. 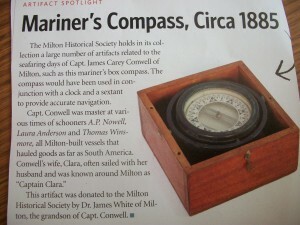 This post came about because there was an article in one of the local magazines this summer about The Milton Historical Society in Milton, Delaware, holding in its collection a large number of artifacts related to the seafaring days; a mariner’s box compass. In my family there is one. It is so simple and beautiful. Prior to the introduction of the compass, position, destination and direction at sea was determined by the sighting of landmarks and the observation of the position of celestial bodies. Ancient mariners kept within sight of land. 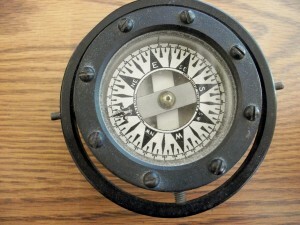 The invention of the compass enabled the determination of heading when the sky was overcast or foggy. Note: Information for this post was taken from Wikipedia. With that in mind I guess I would have to say that Autumn is my favorite time of the year. The air is so crisp; but nature’s glow is just amazing. That’s when I decided that a stop to Tomato Sunshine was the thing to do on such a beautiful day. Tomato Sunshine is located at 4312 Highway One (Rt. 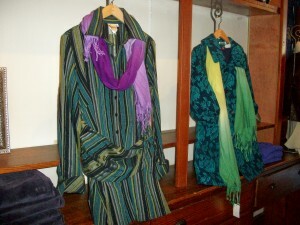 1 or Ocean Highway) in Rehoboth Beach. Tel. 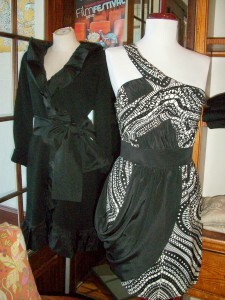 is 302-226-9533. 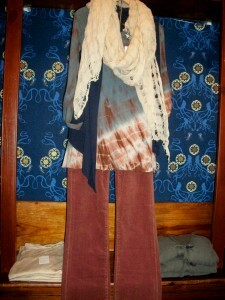 The website is www.tomatosunshine.com. 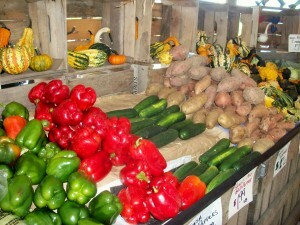 I write about it all the time because visiting this garden center and local produce market puts a smile on my face. The weather has been beautiful in the Delmarva Peninsula for the past 15 days and as I was driving past Tomato Sunshine the colors were incredible. So, a bee line towards the parking lot is what I took. 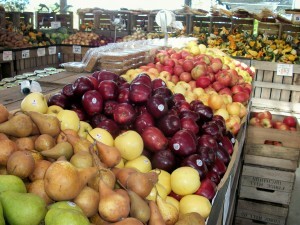 You will find all kinds of produce at this time of the year, as well; apples, plums and vegetables, among others. Tomato Sunshine has an excellent website full of information, tips, calendar, etc., so make sure to check it out. You can contact them through e-mail, as well. 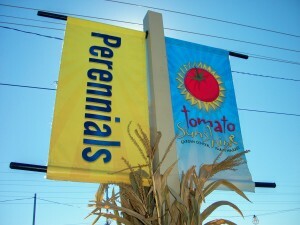 ernie@tomatosunshine.com, donna@tomatosunshine.com, info@tomatosunshine.com, and garland@tomatosunshine.com. 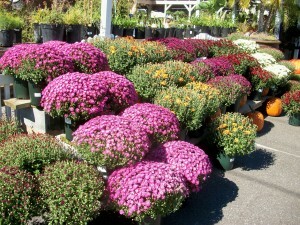 If you have a garden, yard, or containers you know that this is the busiest time of the year. 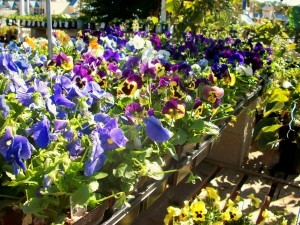 Looking at my own there is seeding, pruning, soon rakings of leaves and the planting of maybe winter pansies. It is a little overwhelming, actually. I guess, I will get it done but at the moment I am still enjoying a lot of my summer flowers. They have gotten brighter these days. 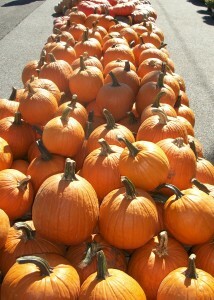 Every year I find it so interesting to see the variety of pumkins. Check the ones I found out this year. 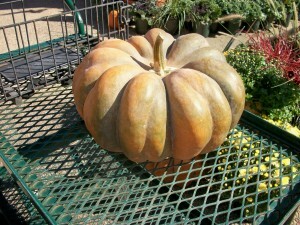 Cinderella Pumpkins – Ornamental pumpkin, which is deeply ridged. 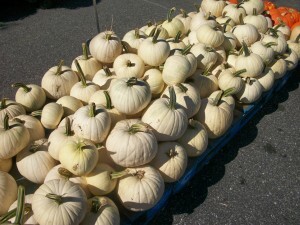 White Pumpkin – Becoming increasingly common and are all the rage when it comes to chic autumn decorating. 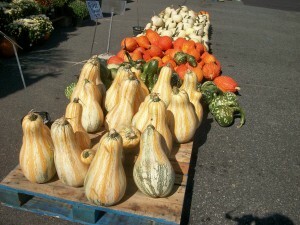 Hubbard Squash – One of the best keeping squashes because of the extra hard skin. 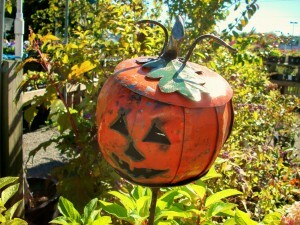 Fairytale Pumpkin – The French name is “Musquee de Provence”. It is a very unique eating and ornamental pumpkin. The deep orange flesh is very flavored, sweet, thick and firm. 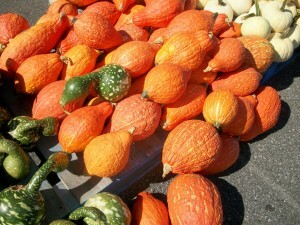 Carnival Squash – Cream colored with orange spots or pale green with dark green spots in vertical stripes. 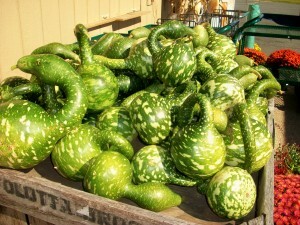 The goose gourds are beautiful too and they look just like a goose. 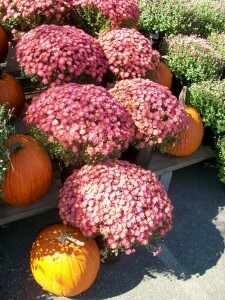 Used in a lot of the fall decorating. Yes, it was nice checking all that Tomato Sunshine has to offer; pretty isn’t it and so lucky to be just around the corner. Talk to you later and have a really beautiful day…. 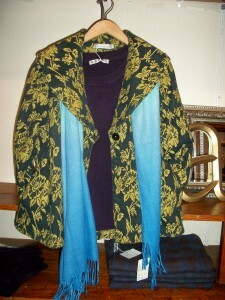 I keep going back to this particular boutique in Lewes, that historic town that I also mention here and there. All you have to do is visit it once and you will be hooked. 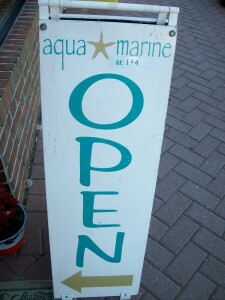 Aqua Marine is located at 114 Second St., Tel. 302-644-4550. 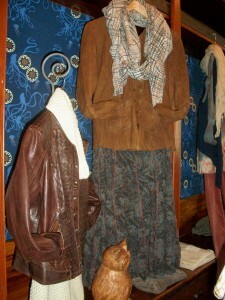 The shopkeeper is Maureen Botti. Her helper? Her mother!! 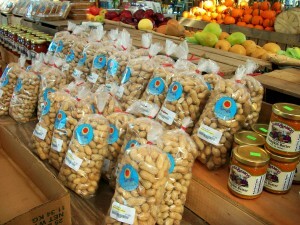 Well, I think Maureen and her mother are one of the reasons I visit the store frequently. Their friendly disposition is a winning situation. When I wrote a post on Aqua Marine on May 15th I mentioned that I really enjoyed watching Maureen and her mother deal with their customers. There is an instant connection that you can tell will last a long time. By the way, if you want to see that post just click on the month of May under Archives on the left hand side of this blog and scroll down to the date. 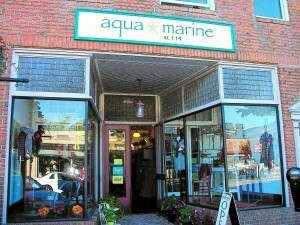 This is a new location for Aqua Marine, but the boutique opened in 2006. It is the perfect setting being that Second Street in Lewes is actually the Main Street, where lots of cute stores and great restaurants abound. The casual atmosphere of the beaches is something we love; Aqua Marine carries that type of clothing; relaxed, yet sophisticated at the same time. 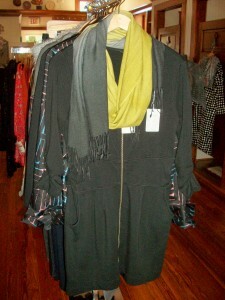 Christopher Blue’s new line “worn” has affordable cords, and a great fit!! 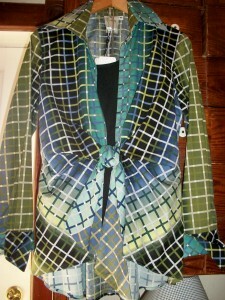 Another brand carried is Magaschoni Cashmere. 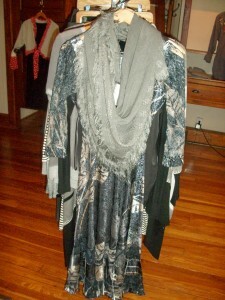 And, lots and lots of scarves; all colors, fabric and price points. 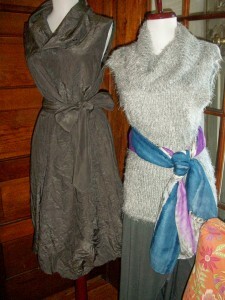 The weather is changing; a little cooler; it was great to see what’s new for the coming season. 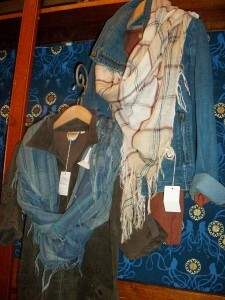 Even though I refer to these kinds of posts “for women only”, men should not be intimidated by these boutiques. Usually the owners are more than happy to give you a helping hand. Talk to you later…..have a great one…. 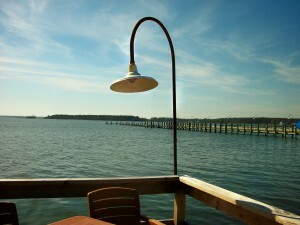 Dewey Beach has gotten much quieter since the Labor Day Week-End. But, still the week-ends bring a lot to this town that during the summer is the beach town that never sleeps. Friday, 9/24/10 and Saturday, 9/25/10 is the 10th Annual Elvis Fest in Dewey Beach. 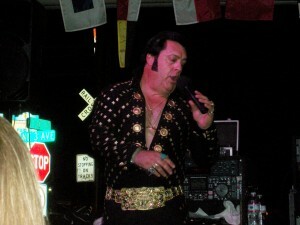 Two days of Elvis impersonators competing for $5,000 in cash. Venue? 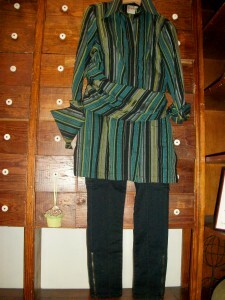 Rusty Rudder but for more info. 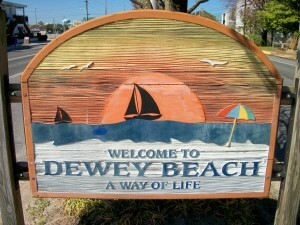 please call 302-227-3888 or visit www.deweybeachlife.com. Thursday, 9/30/10 – Saturday, 10/2/10 is the Dewey Beach Music Conference, 135 Bands, 11 Venues; 3 days of panels and workshops. 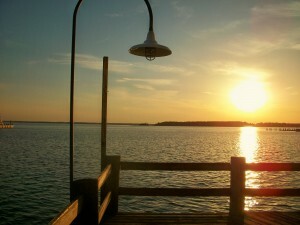 Please visit the website www.deweybeachfest.com for much more info. All night time shows are free to the public starting at 7:00 p.m. until 1:00 p.m. 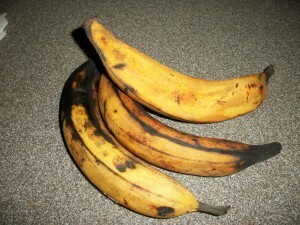 I am still trying to master cooking with plantains; a versatile vegetable used in a lot of the Latin cuisine. So, I had some ripe plantains in my house and decided to make a Pinon. 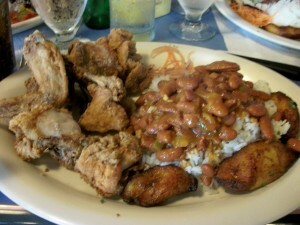 This a Puertorican traditional dish. 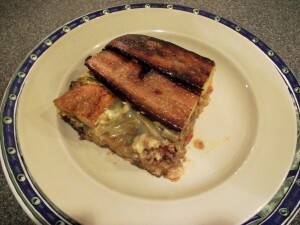 It is basically a lasagna using plantains instead of noodles. Still peeling and then slicing them lenthwise is tricky. I would like to be able to slice them thin but it is hard. 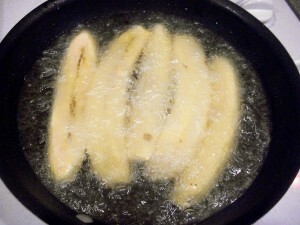 Then, you have to fry them until they reach a golden color. 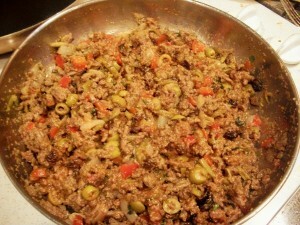 The word Picadillo means chopped; the ground beef, onions, olives, and everything you want to add to the meat. I had to sit down and write the recipe because it was one of those that you add a little bit of this and a little bit of that. Oh, let’s try that spice or let me add more raisins, you know, making it your own. So, here it goes. 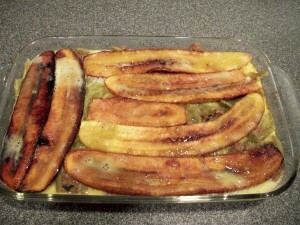 Peel plantains and cut lengthwise. Fry them in the oil until golden. Take out and place on paper towels to drain. In a separate frying pan put the olive oil and add onion, pepper, garlic, oregano, cilantro, cinnamon, cumin and any other spices that you might like to add. Sautee for about 5 minutes. Then add ground beef and break it down as it cooks. Add olives, tomato sauce, 1/2 of the canned beans and raisins. Cook for another 5 minutes or longer until it becomes a “picadillo”. Grease a 12 x 71/2 x 2 baking dish. Beat 2 of the eggs and place on the bottom of the baking dish. 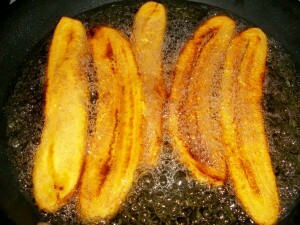 Arrange 1/2 of the plantains on top of the egg mixture. Then put 1/2 of the picadillo and spread, pat it down, and then the rest of the canned beans on top. 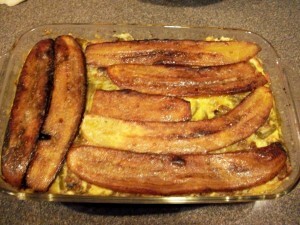 Once that is done then arrange the rest of the plantains, beat the eggs and put that mixture on top of the plantains. The idea is that when it bakes the eggs will hold everything together and you will be able to slice it without crumbling. Place it in the oven for about 30 minutes or so. Serve with a green salad and you have dinner. Remember cooking comes from your heart….Talk to you later…. Note: To make a Gluten Free recipe always read the labels.